The concept of an absolute formation does not exist. It’s a myth, crammed into our heads by analysts and newspapers, oversimplifying things. There’s no such thing as playing 4-4-2, no 4-4-2 is the same in the way they actually take to the field and move around on the pitch. Every team has at least an attacking shape and a defensive shape. You don’t play with a back four the entire time, you play with three at the back when going forward, as one of your wingbacks joins the midfield, four at the back when transitioning between attack and defence and perhaps five at the back when defending, as a midfielder may drop back to help out the defenders. In conclusion, style is more important than a formation, which can change depending on the players you have on the pitch and the instructions they are issued. Let’s have a look at a typical strikerless goal, my Fortuna side taking on Excelsior Rotterdam and one of my wingers scores an easy goal. The goal itsself is not that important here though, it’s the build-up that made the goal happen you should be concerned with. It sounds great when you read it like that, it even makes complete sense, but how do you translate a concept into a working tactic in-game? How do you create movement? For me, this means I need to assess two things. Who are the hybrid players and where do natural overloads occur? A hybrid player is a player who is in a specific position defensively, but moves into an entirely different position when the team is on the offence. During the transition phase from offence to defence and vice versa, these are the key players who need to position themselves well. An overload is where there are more players from one team in one area than another. For example, when the left wing-back steams down the wing to receive a flick-on by the left winger, you are creating an overload in this area. Any time somebody has more players in one area, it’s an overload. In terms of stretching a defence, the hybrid players are key players and are the ones constantly creating the overloads. Now there are two different types of stretching I want to differentiate between, those being horizontal and vertical stretching. The premisse of stretching a defence is as easy as it is effective. By stretching the defensive line, by drawing defenders out wide, you are creating gaps between the lines, causing unrest and undermining the cohesion and organisation of the defenders. Personally, I’m a rather visual person, so instead of just elaborating with endless paragraphs of text, let me show you what I mean with a video-clip. The presence of the winger, Byun Kang-Jin, draws the wing-back away from his defensive line, forces the defender to maintain a wider position than he might like. The hybrid player here is the wing-back, who is one of the key players during the transition from defence to attack (and vice versa, naturally). The wing-back, Schramm, charges forward, sets-up a sort of one-two passing triangle with the winger, who is then released into the space behind the opposing defensive line. The defender went out too wide to get cover from his central defenders, went in too aggressive on Schramm and found himself out of position. If the match clip was a bit too fast for you, let’s slow it all down. Let’s look at the initial setup of the attack. The blue line represents the defensive line, whilst the red lines respresent the offensive movements. You can see that the opposing defensive line is fairly compact, all players are maintaining their positions, there is no space for anyone to directly exploit, as the wing-backs are covered by the central defenders and even two defensive midfielders just ahead of the defensive line. 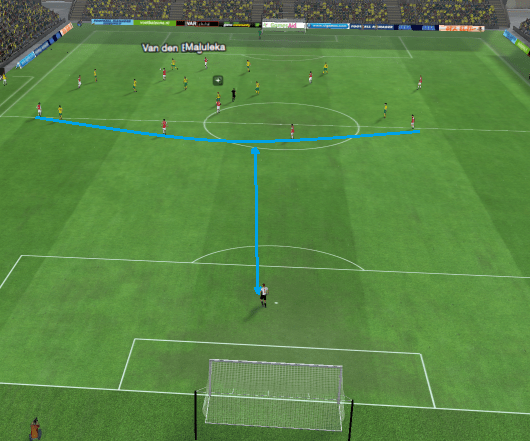 The blue line represents the defensive line, the red line the offensive movement, the yellow line the ball’s movement. In the second picture, was taken just a second after the one-two, when Schramm sent the ball into space, you can see the positioning has changed. 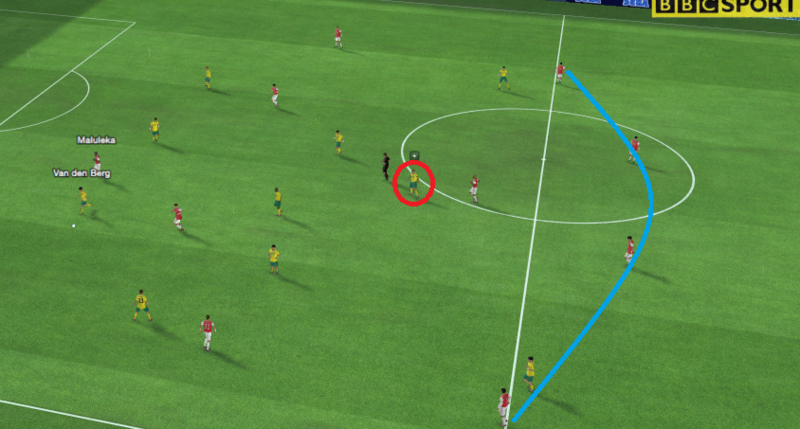 The wing-back has moved towards the ball and has been drawn out of position. Kang-Jin has been released into space by Schramm’s through-ball. The central defenders are attempting to provide cover, but cannot shuffle to their right side fast enough to adequately provide cover. The other wing-back on their left side is also leaving more space between himself and the nearest central defender, because he has to cope with the threat of my right winger. The organisation is gone, the cohesion between the defenders has desintegrated, which is made apparent when Kang-Jin’s cross sails into the box, past the two central defenders, whilst the left wing-back is too late cutting back inside to stop Vankan from slotting the ball past the goalie. Their defence was over-stretched and they paid dearly for their mistake. The basic premisse of vertically stretching a defence is the same as the horizontal stretching approach. You try to create gaps between the lines, so runners can exploit this space. In this scenario however, we are not stretching the defensive line itsself, but the space between the defensive line and the goalkeeper. Again, I shall provide you with a match clip to illustrate my point. It looks fairly simplistic, doesn’t it? Long ball over the defence, a fast midfielder latches onto the ball and slots it past the keeper. Indeed, it does look simplistic, but how do you get an opposing defence to push so far up the pitch? That’s where the strikerless concept comes into play again. Because you lack an advanced focal point for your passing, as in some sort of forward to hold up the ball, you have to rely on players movement into space to either receive the ball or create space for others. This either means that an opponent allows you to outnumber their midfield, with the trequartista dropping back, or an opponent pushes up his defensive line, to try and prevent the strikerless formation from dominating the midfield. The blue line represents the defensive line, the red circle represents the actual goal-scorer. Looking back at that match clip, I have screenshotted the start of the attack. The opposition have opted to push up their defensive line, to prevent the trequartista from outnumbering the midfielders. With the wingers providing a wide threat, the wing-backs are forced to defend on the half-way line. I believe this screen does not do the actual space behind the lines justice, so allow me elaborate. Again, the blue line represents the defensive line and the space behind it. Because of the trequartista’s movement, the defenders are forced nearly onto the half-way line, which makes an opposing team very susceptible to a fast counter-attacking move. It may look simplistic and rather unrefined, lacking the elegance of the pass and move attacks you get when you are horizontally stretching an opponent, but it’s still very effective and a testimony to the efficiency of a strikerless formation. Hii I ‘ m following your tactical blog since Fm 14..and I like your concept of strikerless..regarding to make shape compact while scretching the defence, what is ideal ground size for it?? I generally opt for the largest pitch possible.